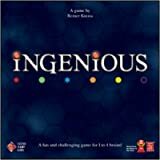 In Ingenious, a.k.a. Einfach Genial, players take turns placing colored domino-style tiles on a game board, scoring for each line of colored symbols that they enlarge. The trick, however, is that a player's score is equal to her worst-scoring color, not her best, so she needs to score for all colors instead of specializing in only one or two. 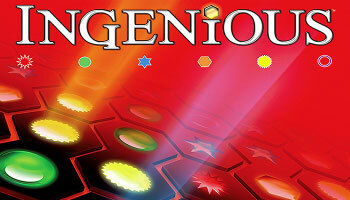 In more detail, the game includes 120 domino-style tiles, each consisting of two conjoined hexes; each hex has one of six colors in it, with most tiles having different-colored hexes. Each player has a rack with six tiles on it, and on a turn a player places one tile from her rack onto two hexes of the game board. For each hex on this tile, she scores one point in that color for each hex of the same color that lies adjacent to it and each hex in a straight line from it. If a player brings the score of a color to 18, she immediately takes another turn. At the end of her turn, she refills her rack to six tiles. (Before refilling her rack, if she has no tiles on it that contain hexes in her lowest-scoring color, she can discard all of her tiles, then draw six new tiles from the bag). 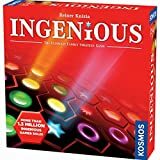 Ingenious includes rules for solitaire and team play; in the latter case, two teams of two play, with each player not being able to see his partner's tiles and teams keeping a combined score that maxes out at 36 instead of 18. Put the tiles in the bag and shuffle them. Each player displays one score board in front of him and places one peg of each colour in the hole to the right of the colour symbols (value 0). As a game variant, players sitting opposite each other may form a partnership. All standard game rules apply, but each partnership uses a double-length score board by placing two regular score boards together. Both partners apply their individual scores to their joint score board. When no further tile can be placed on the board, the partnership with the better score wins - in other words, the partnership with the lowest counter loses.